The Castell 9000 is a famous and iconic pencil. A flagship product of Faber-Castell, the world’s largest pencil company, the 9000 has over a century of history as an important working tool of writers, artists and engineers. The dark rich green (“forest green”) has varied in shade over the years, but the current version is excellent. It makes for a very handsome pencil. It seems similar to the palette used by both Mazda and Land Rover in the automotive field. 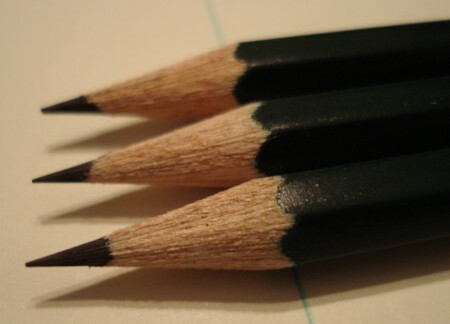 Most 9000 pencils are sold sharpened, without eraser. (There is a variant with eraser.) There is a wide range of hardnesses offered, but today we’ll restrict ourselves to the HB version. Following the methods mentioned in the Staedtler Mars Lumograph post, I weighed several pencils. The range was 3.6 to 4.1 grams, with the mean 3.9 grams. So it may be a sliver heavier than the Lumograph, our reference pencil. The length is the standard 175mm. The distance between opposite sides in 7.3mm, making it slightly narrower than the Lumograph. Being thinner yet heavier than the Lumograph is presumably due to the wood. There is only one noticeable physical difference – the hexagonal edges are slightly less rounded on the Castell 9000 than on the Lumograph. I like this, and think it may slightly improve the grip. Let’s introduce some terminology to describe the six sides of a hexagonal pencil. We’ve already used the ‘obverse’ and ‘reverse’ terms (borrowed from the numismatic field) in previous reviews. Side 1: The pencil’s obverse – the pencil’s main markings – usually the manufacturer and model names. Side 2: The next side, viewed clockwise, from the perspective of the pencil’s cap. Side 3: Again, the next side of the pencil. Side 5: Again, the next side of the pencil. Side 6: Again, the next side of the pencil. I like pencils with clean looks – and this is just too much writing – three different sides of the pencil, each half covered with text. It’s a great writer. Side-by-side with the Lumograph, the Castell 9000 is just a touch harder and lighter. The point seems unusually good at staying sharp. In B, right up to 4B, the pencil becomes buttery smooth. I’d like to be able to better describe a pencil’s marking capabilities, but this is a challenging problem for which I haven’t found a satisfactory solution – the pressure used, the angle of application, the shape of the lead prior to use, and the paper are all important contributing variables. Paper can be standardized, but the other factors probably require special equipment to reproduce. I presume pencil companies have this type of equipment (a pencil gripping robot?) for their testing. Perhaps the best endorsement is the century of commercial success experienced by the Castell 9000. If you’ve somehow avoided this pencil – pick up a few to try. I doubt you will be disappointed. Leadholder.com page on these pencils, including links to historic catalogs. An excellent source if you’re seeking to date a particular pencil or learn more. Michael Leddy’s essay on the 9000. As a point of information, a while ago I inherited a metal box full of 9000s from somewhere or other, rather old (perhaps prewar). I sharpened up the last HB a couple of days ago and said to myself “Dang! This is a nice pencil.” Little did I know it had such a celebrated history. My wife is aware of my addiction to penciliana and she mentioned it to her boss who reached into a desk drawer and said “here you are.” There was a battery powered pencil sharpener in each hand-one a product of Hong Kong, straight blade type of no particular virtue but the other…the other is a beautiful red and black Hitachi PH-101 rotary type-although it is a single rotor-and it is an outstanding example of the type. I am still using a Hitachi PH-101 that I purchased maybe 20 years ago. This is a battery operated pencil sharpener-“cordless DC6V AAsizeX4”. It is “the best”. I would like to get more of them. Are they still available? if so where? Or is there another product as reliable? Any help out there? Rae, stay tuned, we’ll soon have some sharpener content! As far as I can tell, the only reason to use two helical blades in a sharpener is that it will work in fewer revolutions. This may be an advantage in a hand cranked high-torque low speed machine, but for a high(er) speed electric, it wouldn’t matter. Cutters might last longer, I suppose, but I’ve never seen a dull helical sharpener. The new iPoint has a titanium/chromium nitride coated blade as a selling point. Might be an issue if some of the new woods are more wearing to blades. I cut off eraser ends with a dremel sometimes, and one of the generic yellow modern pencils (Target?) was MUCH harder to cut through than a paper mate american, or mirado. FWIW, Panasonic’s KP-4A is a USA-available helical blade battery powered sharpener. In the 80s, Royal made one too, much to the annoyance of my elementary school classmates. Interesting to hear about the Hitachi, though. I’ve been reading through patents and they have one. The claim is that using a component between the opening and the blades that lightly grips, and thus slows down, the pencil makes helical battery powered operation practical. An odd claim since DC motors have more torque at low RPM than the shaded-pole AC induction motors used on even the high-end Panasonics. I think straight blades are the norm for battery sharpeners only because they can sell them for $10 instead of $15. . At least with the iPoint battery one, you can see the insides while it works, which I find is the only way to avoid serious oversharpening from that type. Interesting that this iconic pencil has only 5 comments when the its counterpart Staedtler Lumograph has 31 comments and FC9000 has 5 and three of these are nothing to do with the pencil. I wonder whether this is a result of poor marketing by Faber Castell. I personally prefer the 9000 because of its point holding ability, but B grade is much smoother than HB. I prefer the dark green livery of current production to the lighter grass green of earlier versions. Interestingly the version above has the country of origin. My recent stock is sans country of origin and I suspect this is because it is from their Malaysian production factory as I’ve seen recent FC 9000’s that are marked “made in Germany”. It seems to be a trend with big manufacturers that the country of origin is not engraved on stock coming out of SE Asia/China – Parker do not stamp their China manufactured stuff but do stamp their France made stuff. Anyway just a bump for my favorite pencil and I include Tombow Mono 100 and Mitsubishi Hi-Uni and Lumograph in that list – FC9000 just seems less intimidating and more of a friend. Interesting that this iconic pencil has only 5 comments (three of which don’t relate to the 9000) while its counterpart, the Staedtler Lumograph has 31 comments. While I am comparing my FC 9000’s with the ones above I should also note there is no side 5 at all – just two sides are lettered/stamped/engraved in any way. On the reverse side there is a barcode number 4 005401 171003 ‘HB’ and an etched “production batch?” stamp – M6. The obverse is per your description above. Would the different barcode have something to do with production from different factories?? I write extensively in pencil. My favorite is the Castell 9000. I do mix it up with Mitsu-Bishi Hi-Uni, Tombow Mono 100, and Staedtler Lumograph (all in HB) coming out to play regularly. They all have their own special qualities. It depends really on what you most value as far as I am concerned. I don’t agree that any of these are objectively “best” but they all are quite pleasant to me. Another that I rather like is the Koh-I-Noor Toison D’Or (Czech). I don’t understand what the big deal is about the various Blackwings. Not to my taste. I want to like the General Kimberly as they are made in USA and inexpensive but they seem inconsistant in quality. Hitachi P-101. I still have and use the P-101 that I purchased almost 30 years ago. It still sharpens quickly and to a fine point. If I could find another, I would buy it. I have been looking to purchase another for a couple of decades now to have one at work. No luck. Anyone know if they are even manufactured? Previous PostPrevious The Rolodex lives on!